We need fruits in our diet as they are the store house of nutrients to lead a healthy active energetic life but having whole fruits daily is totally boring !to make it interesting you will always like to have it in different forms like fruit salads(in many different forms),smoothies and of-course fruit chaats.This fruit chaat is a main starter meal during holy Ramadan month importantly during the if-tar feast.The specialty of fruit chaats are that they are so versatile that any kind of fruit to your own likings and availability can be added! 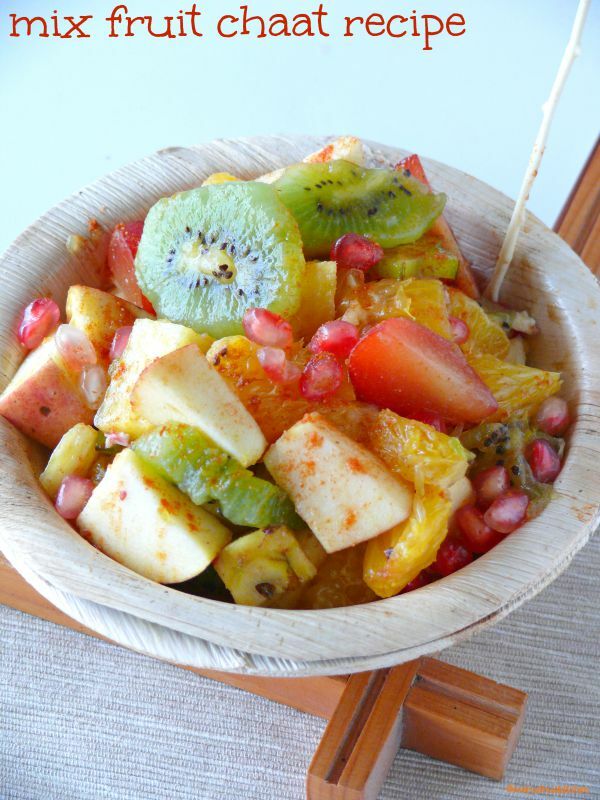 Especially the spices added to it compliment with the nature of each and every type of fruit added with bursting out of flavours in every bite.Fruit chaat is an important street foods in Northern parts of India mainly in the street corners of Delhi! but it is no way a junk food it has every right to be a healthy food,it’s a assertive nutritive high fibre diet and a great digestive appetizer with no compromise in taste.Chilli powder,salt and chaat masala combined with the natural juices from the fruit makes it most flavorsome and an interesting summer snack. Salt – as required and some lemon juice. 1.Refrigerate the fruits before slicing so that it is chill. 2.Add all the fruits in a bowl add the given chilli powder,chat masala and salt as per taste. 3.Squeeze some lemon juice and serve. Salt - as required and some lemon juice. Refrigerate the fruits before slicing so that it is chill. Add all the fruits in a bowl add the given chilli powder,chat masala and salt as per taste. You can use any fruit that is available in that season. I have used some star fruits,kiwi and plums for a change. If grapes are in season use it. Adjust the spice level accordingly to your taste. I think this is the best way to eat fruits. So overtly yummy and the chaat masala adds all the magic. Vani loved the pictures and the fruit chat is truly mouthwatering. Oh YUM! Fruits chaat looks aeosome Vani! 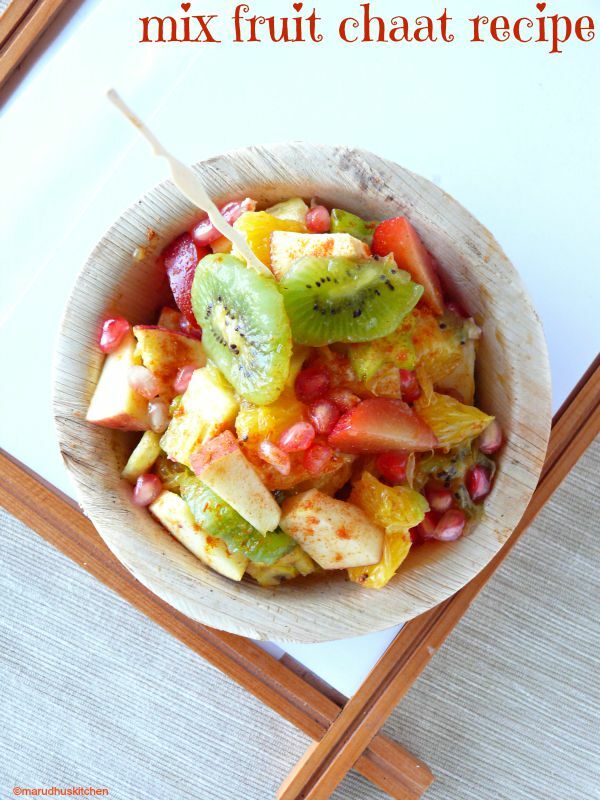 Fruit chaat looks delicious and love the vibrant colours!! Wow! !Am drooling here!! Lovely colors!! Nice that you included kiwi and plum too. Love this anytime, colorful and delicious.. This attractive healthy treat brought me here! Of course fruits are must for a healthy diet. I love salads and this salad looks so delicious . Love the kick of chilli! !